Forty years after fighting in the jungles of Vietnam, Pastor Raul Ries experienced flashbacks for the first time. His struggle motivated him to find three of his closest comrades, men who had fought along side him in the Marine Corp unit ALPHA 1/7:Pete Cicatelli, Tom Kamagtaris and Pete Silva. Ries discovered that these men were also suffering from Post Traumatic Stress Disorder (PTSD). Together again, they embark on a journey of discovery, a journey that takes Ries back to Vietnam and all three onto the path of healing and wholeness. As these men courageously share their vividly portrayed war stories, they reveal the terrible toll that combat took on them both during and after the war. Veterans of the more recent wars in Afghanistan and Iraq share similar stories with Ries as he reaches out to the newest generation of combat veterans. This documentary is the result of a passionate desire to help those who have experienced combat and to lead these warriors on their journey home. In August 1964, an American pilot was shot down and captured by the North Vietnamese. In the following years of the Vietnam Conflict, hundreds of American prisoners of war were interrogated, starved and tortured in Communist prisons. Prisoners of Hope presents the experiences of ten of these individuals who were denied that most valuable and precious possession -- freedom. Their stories are filled with suffering and survival, death and deliverance. But above all, they are testimonies of courage, faith, and a sustaining hope that refused to die. This is a moving program that will change the way you understand freedom and life. The Medal of Honor is the highest award for valor in action against an enemy force which can be bestowed upon anyone serving in the U.S. Armed Forces. The deed for which it is awarded is to be one of personal bravery or self-sacrifice so conspicuous as to clearly distinguish the individual for gallantry above his comrades, and must involved risk of life. 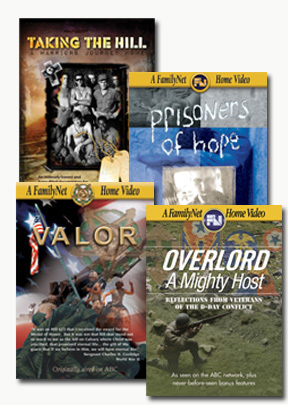 Valor looks at the heroic acts of several Medal of Honor recipients from World War II, the Korean Conflict, and the Vietnam War. These veterans tell their incredible stories of patriotism and courage including their personal stories of faith in God in the midst of battle and beyond. All are men of faith... honor... Valor. On June 6, 1944, the greatest military operation in the history of the world succeeded in landing more than 150,000 Allied troops on the beaches of northern France. Before the battle of Normandy was won in late August, these troops endured some of the most costly fighting of World War II. Overlord: A Mighty Host looks back sixty years on this awesome military event from the point of view of soldiers, sailors, and paratroopers who were involved in the invasion and examines the lives of men who survived that extraordinary conflict.